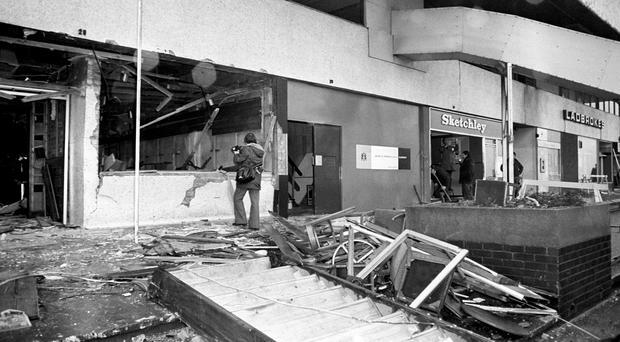 The victims of the 1974 Birmingham pub bombings were "accidental deaths" in an "IRA operation that went badly wrong", its former intelligence chief told an inquest. Mr Conway, who robbed banks for the IRA in the 1970s, added: "The IRA was only saved by the subsequent (ceasefire) talks with the British Government." The blasts at the Mulberry Bush in the base of the city's iconic Rotunda and the basement Tavern in the Town in nearby New Street killed 21 people and injured 220 more. Mr Conway, speaking over a video link from a secure location, was also asked if he knew the identities of the bombers. He said he knew only from "third-hand" reports in newspapers, books and TV documentaries that were in the public domain. In any case he added he would not name any "IRA men" who were still alive. Barrister Kevin Morgan, asking questions on behalf of the bereaved victims' families, asked: "Would you agree that the killings in Birmingham on November 21 1974 constituted murder?" Mr Conway, who was convicted of handling explosives in Londonderry, Northern Ireland, in the 1970s, replied: "No I don't agree. I believe it was an IRA operation that went wrong. "But in the circumstances, as I have been told, I don't accept that it was murder. Coroner Sir Peter Thornton QC asked Mr Conway if the the faulty phone box story could have been a "well-orchestrated and convenient lie" for the bungling bomb team to tell their superiors and escape punishment. He said the IRA Army Council chairman David O'Connell was "lying" when, just weeks after the bombings, he claimed the IRA was still investigating if its men were to blame. "Essentially he was lying, he knew perfectly well what had happened," said Mr Conway, who earlier described O'Connell as an "honourable man". Mr Conway said, at the time of the bombings, IRA operations in England were carried out by active service units "autonomous" of the organisation's command in Ireland, and were picking bombing targets themselves. He said nobody in the IRA's Army Council, which ran military operations, or the organisation's commanders in England had any idea the pubs were to be targeted. Speaking of his own feelings on the bombings, he added: "The bombings had been careless if not downright incompetent." Mr Conway told jurors O'Connell had personally told him the attack "was not sanctioned by them". He added the stated policy of the IRA - which he described as being "at war" with the British state at the time - was civilian targets were "strictly and loudly forbidden". He added: "Those targets ought never to have happened. I have said that many times. "The volunteers who carried it out, the person who commanded them, either didn't know that or ignored it. They were not legitimate targets. "It was a civilian pub, there was no question of it being a pub with which soldiers commonly drank - and it was not. It was not a permissible target."